Games Like Final Fantasy '+g+"
Final Fantasy is a series of video games developed and published by Square Enix (formerly Square). Fourteen games have been released as part of the main (numbered) series. The series is primarily composed of role-playing video games with turn-based battle system. Final Fantasy's popularity has placed it as one of the best-selling video game franchises. 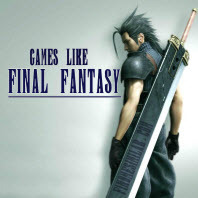 Find the list of role-playing video games similar to Final Fantasy below. Zenonia,...if you can think of more, then don't forget to mention it in comments.